Amidst the gloom of global economic meltdown and tumbling PC sales, Intel's plucky little Atom processor has provided a glimmer of hope. For starters, Atom has been the driving force behind the explosively popular new netbook segment. And later this year, it will attempt also to assimilate the smartphone market with the arrival of Moorestown, a massively more power efficient revision of the Atom architecture. So far, however, Atom has frankly flopped when tasked with more performance-critical workloads. Whether it's HD video decoding, gaming or heavy duty web browsing, Atom simply hasn't had the necessary chops. Partly that's a function of the modest processing power of the Atom chip itself. But it also reflects the absolutely feeble Intel integrated graphics with which it's been paired. You could say, therefore, that what Atom really needs is a new chipset with decent graphics. That's exactly what graphics specialist NVIDIA is betting on with Ion, its new Atom-compatible motherboard chipset. Actually, Ion is nothing new. It's little more than a repackaging of the firm's familiar GeForce 9400M integrated chipset. That's possible because the Atom CPU uses essentially the same bus interface as the Intel Core 2 processors for which the 9400M was originally conceived. But that's no bad thing. To take one high profile example, Apple reckons the 9400M is good enough to power a whole range of systems including several MacBook and iMac models. More to the point, Ion / 9400M is definitely a massive upgrade in terms of 3D horsepower and in particular hardware 2D video decode features compared to Intel's awful integrated graphics. 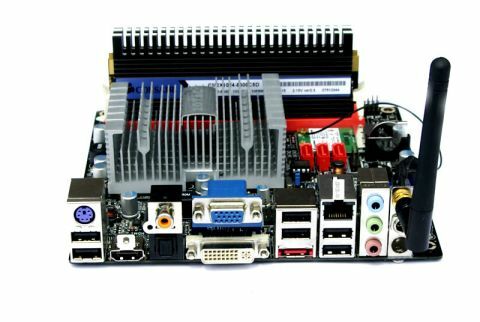 Anywho, our first taste of Ion comes in the form of this natty little mini-ITX board-and-chip combo from Zotac. On paper, it's a fantastic package and comes complete with the flagship Atom 330 processor. It's a dual-core 1.6GHz chip with 1MB of cache and support for two threads per core.